The catch of tupong in the Thomson River using electrofishing in 2017 was the highest observed in 13 years. Scientists setting their sights on learning more about the influence of river flows on native fish in Victorian waterways recorded a boom season for tupong across southern Victoria. some of the highest numbers of tupong in the Thomson River in 13 years. Why has this been such a bumper year for tupong? In part, it's to do with river flow. Tupong, also known also as congolli, are common in southern Victoria, but belong to a group of fish about which we don't know much. "They're diadromous, meaning they spend parts of their lives in saltwater and parts in freshwater," explained Arthur Rylah Institute Research Scientist Frank Amtstaetter. "We know there are several factors that influence the presence of tupong and other diadromous species, primarily spawning, immigration into rivers and their ability to survive," Frank said. "We're working on finding out more about how tupong respond to environmental conditions, particularly flows in the rivers – how flows affect their lifecycle and that of other diadromous species," he said. Young tupong migrate into streams from the sea in spring and summer. Conversely, adult tupong migrate from freshwater downstream to the sea in autumn and winter to breed. "There is evidence that adult spawning migrations are triggered by increases in river flows," Frank said. "For example, adult tupong implanted with acoustic transmitters migrated 40 kilometres downstream during a pulse in river flows. We are investigating the link between movements of that sort and flow pulses." Frank said studies were also continuing on the effects of river flows on the migration of juvenile tupong into rivers and on their survival rates. "Based on the first year of sampling using netting and trapping last spring, numerous tupong were captured migrating into freshwater during late spring in rivers such as Gippsland's Thomson and Tarwin rivers. "The catch of tupong in the Thomson River using electrofishing in 2017 was the highest catch rate observed in 13 years of monitoring on this river," Frank said. "More than 80 percent of the tupong captured in 2017 were less than one year old, indicating that tupong are successfully spawning, migrating to freshwater and surviving," he said. "The upstream dispersal of juvenile tupong can allow them to take advantage of additional habitats for feeding, growth and survival, which may be important to growing the population," Frank said. where the river becomes a series of disconnected pools, then the fish cannot migrate upstream." Environmental watering for diadromous fish occurs during autumn and winter to trigger spawning migrations, during spring to attract fish into coastal streams, and during summer to trigger migration. "In addition, summer base flows are maintained in a number of rivers to provide river connectivity, which allows tupong to migrate upstream," Frank said. "For example, in 2017 in the Thomson River, tupong dispersal upstream was possible during the summer with higher baseflow conditions. Similarly, juvenile tupong migrated to the upstream portion of the middle reaches of the river by early February." Frank said age verification data and continued sampling under various flow conditions would continue to add to the knowledge of the tupong life cycle and the influence of river flows. "The findings can help inform when environmental flows are beneficial and how much water is required," he said. 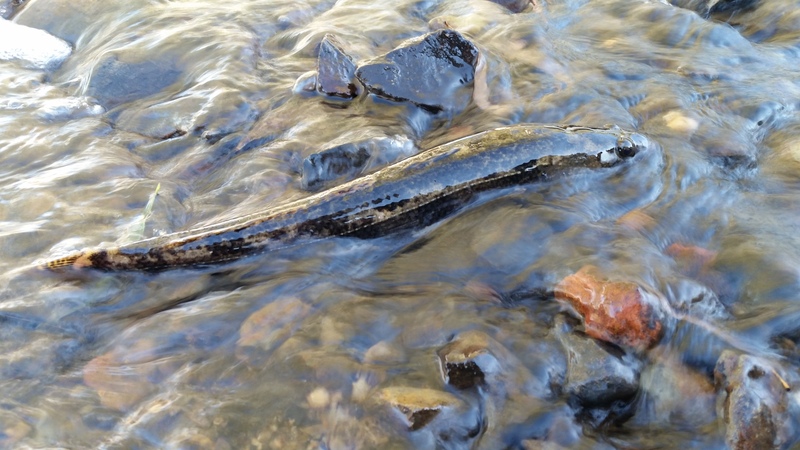 "We plan to sample for another two years and will analyse the data to investigate the role of discharge, including environmental flow releases, on the immigration and upstream dispersal of diadromous fish."